GaitScan™ is PhysioActive’s newest tool to help our therapists better assess and educate our clients using the latest technology available in healthcare. Our GaitScan™ force plate uses over 4000 sensors to record when and how hard your foot strikes the ground with each step. This data along with a comprehensive clinical exam of how you walk allows your Physiotherapist or Chiropodist to accurately detect abnormal foot function as you stand and walk. 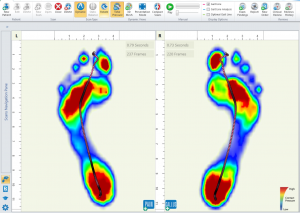 By identifying areas of excessive pressure on your foot the GaitScan™ provides your therapist the ability to view a patient’s foot pressure in both 2D and 3D. Your therapist can make quick accurate comparisons of the right and left foot as well as compared to optimal foot function. The result is the detection of imbalances, easy identification of high pressure areas, biomechanical inefficiencies, and other indicators of common leg and foot problems. Our treatment approach incorporates the use of orthotics if necessary with a global treatment approach to efficient body balance and function. The state-of-the-art 3D animations help our patients understand common lower limb conditions and to understand the benefits of orthotic therapy and how it works with your therapy. Is GaitScan™ suitable for me? Symptoms related to poor foot mechanics, which can include localized foot pain, bunions or hammer toes, arch or heel pain, or pain in your legs, knees, hips, back or even neck! Athletes looking to maximize performance. Do you run better on a cork track or beach sand? How does your foot react with the ground? These can all affect your performance. If you want to be proactive and look to prevent problems occurring in the future. Abnormal foot function can result in other common conditions such as localized foot pain (metatarsalgia, bunions, neuroma) heel and ankle pain (plantar fasciitis/ Achilles tendinosis) and other lower limb problems such as shin splints and patella-femoral pain can improve with orthotics. Sometimes even low back pain and headaches may be alleviated with orthotics, especially if you spend a great deal of time on your feet. How do I get referred for orthotics? You don’t need a referral for orthotics or to be assessed for their benefits. If you’ve been advised that orthotics could help you or just think that they’d benefit you, just give us a call at 905-695-0371 and we’ll be happy to discuss your symptoms. From there we can book you in for a foot scan if we think orthotics may benefit you. However, some insurance plans may require a medical doctor or Chiropodist referral for reimbursement. It is always better to check with your insurer first or ask our helpful staff how we can do a pre-determination for you. We have a Chiropodist on staff to assess and provide the appropriate paperwork for reimbursement if that is what you require. Are there different types of Orthotics? Yes, TOG GaitScan™ offers a range of orthotics to suit your lifestyle. These include orthotics for sport, casual day to day wear, dress shoes, children & even skiing and skating. There are more than 20 different types available from Gaitscan and your physio will help decide which would be the most suitable for your needs. All types and sizes of dress and running shoes are also available and these shoes can be included in the price of your orthotics. 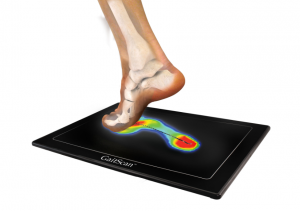 How Do Orthotics and our GaitScan Help? We use GaitScan™ along with an interpretation of your history of injury and functional requirements including footwear to assess the best course of treatment, beit orthotic therapy or physiotherapy. What do my feet have to do with my health and performance? Your feet have a direct impact on the rest of your body. Like the foundation of a house, your feet support the weight of everything above them. They also absorb all the forces during walking. Even a change in function of your feet can make a subtle change in the way you walk and can cause a chain reaction of adjustments in your posture and walking biomechanics. These changes can put stress on joints higher up in your body, and can lead to more serious problems such as pain and injury. Think of even a slight alteration of the axis of a wheel of spinning top. Even small change can create a huge impact in function. GaitScan™ custom orthotics help rebalance your feet, reduce pain and discomfort, by enhancing your body’s natural movements. In close partnership with GaitScan™, PhysioActive uses orthotics to enhance your treatment and add to your general well-being no matter where your feet may take you. Who is the best profession to see if I need orthotics? Research has shown that the best clinical outcomes for injuries occur with the combination of physiotherapy and orthotic prescription. Traditionally Physiotherapists assess lower limb injuries from the body downwards to the feet and chiropodists or podiatrists assess from the foot upwards. At PhysioActive we provide a seamless, 1-stop, integrated, hassle-free service for you to solve your injury problems and concerns. We are able to offer a unique combination of physiotherapy & orthotics, tailored to your specific needs. You will see our specialized lower limb therapists who combine their expert biomechanical knowledge and skills with technology to build you a dynamic, customized, problem solving orthotic. 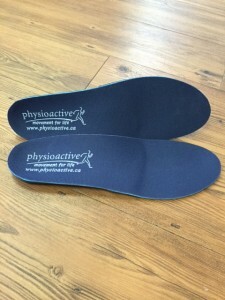 More info regarding how orthotics and Physioactive can improve your well being and performance. Watch this short video on how GaitScan helps your experienced Physioactive therapist help you! © 2019 Physiotherapy Center & Orthopedic Sports Injury Clinic - PhysioActive. All Rights Reserved.